It is not a simple task to recap an entire football league season in a series of words and comments. This is no less true when it comes to the 2018 Indoor Football League season. From the promise of eight teams comprising the league's 10th campaign, it was reduced to six following a legal dispute involving the change of leagues for the Bloomington Edge and West Michigan Ironmen. The teams were forced to delay or scrap plans to play in any indoor/arena league during 2018. The Ironmen finished their 2018 season as members of the Midwest Professional Indoor Football league, going 3-0 and winning the MPIFL Championship. Meanwhile, the Edge already have begun a six-game summer independent season, and stand at 2-0 after two games. After the season ends, the Edge will reportedly join the IFL in 2019, while the Ironmen are returning to their former league, Champions Indoor Football. With Bloomington and West Michigan out, there were only six returning IFL teams comprised the 2018 season. The expectations were high for the defending champion Arizona Rattlers, coming into their second IFL season since moving over from the Arena Football League in late 2016. Expectations for the Sioux Falls Storm were, perhaps, even higher. The Storm came into the season having appeared in the seven previous United Bowls, winning six straight from 2011 to 2016. Could the Rattlers hold on to their title for another season? Could the Storm return to championship form? What would become of the Iowa Barnstormers, coming off their best IFL season by finishing 13-3 with their first trip to the playoffs? During the off-season, they lost quarterback Travis Partridge, one of the top quarterbacks in the league, so there would be a transition. Could the Barnstormers retool themselves and make another playoff run? Meanwhile, the Nebraska Danger looked to emerge as a contender for the IFL Championship with a new and experienced head coach in Mark Stoute, along with the return of quarterback Damien Fleming. With former head coach Adam Shackleford calling the plays, would the Danger have one of the most explosive offenses in the league? And how would the Cedar Rapids Titans and Green Bay Blizzard fare against the previously mentioned four foes? The Titans were just a year removed from a playoff berth, while the football rich Blizzard would look to improve on their 3-13 record from the 2016 season. Overall, was there enough talent in the pool to spread around to give each team a chance to accomplish their respective goals? 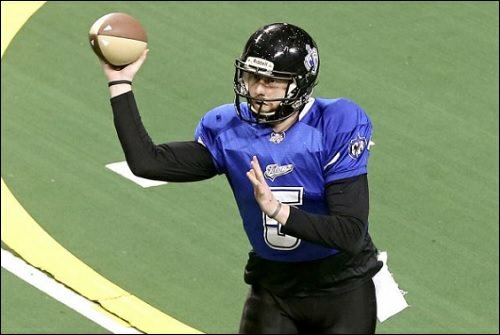 Quarterback Jake Medlock was a major player for the Titans, and the IFL, in 2018. All those questions, and many more, were answered during the course of the season. After four weeks, the Nebraska Danger were the league's lone undefeated team at 3-0. However, Damien Fleming fell to a season-ending leg injury and Nebraska fall into a tailspin. QBs Jesse Scroggins III and Gregory Hankerson, Jr. never reached the pinnacle that Fleming had set, as the Danger would go on to lose 10 or their next 11 games and limp into the playoffs with a 4-10 record. Despite losing 10 of 11, the Danger played some tough games and showed a lot of fight. Some of their closest losses came against the Sioux Falls Storm. The lost to the Storm by margins of 8, 14 and 4 points over their three-game season series. But they lost 10 of their last 11 games and limped into the playoffs. With four games left in the season, the team released Stoute and replaced him with co-interim head coaches Adam Shackleford and Cornelius "Pig" Brown." The duo helmed the team for the last four games of the regular season, and in their 48-17 United Conference Championship Game loss to the Barnstormers. Nebraska got a leg up on the off-season, naming Pig Brown as head coach going forward. Shortly before the United Bowl was played on July 7. The Green Bay Blizzard opened the season under head coach Chris Williams with expectations of the team cracking a playoff berth for the first time since 2012. The Blizzard's offensive attack was very run heavy. QB Christian Lemay, replacing Matt Behrendt after two seasons, led the offensive attack, but without an effective running and passing attack, failing to win in his starts. The Blizzard came close to a win in Week 4 against the Rattlers, but Arizona was able to pull out a 37-31 win. After going 0-5 to start the season, the Blizzard released Williams and named former Green Bay player and assistant coach Corey Roberson as the interim head coach. The coaching change was made amidst a two-week bye that eventually became three weeks when their home date against the Titans was canceled due to to an extreme storm in the region. The Blizzard won their two games of the season over a three week span. Both wins came at the hands of the Danger, 47-25 on May 5 and 31-20 on May 18. Finishing with a 2-10 record, changes are expected for 2019, but at the time of this recap, a permanent coaching announcement has not been announced for 2019. Cedar Rapids was an interesting story throughout 2018. Despite a 3-11 season, individual performances were the highlights of the season. Rookie quarterback Jake Medlock was the league's top passer, while rookie defensive lineman Ricarlo Bell led the league in sacks. Both players were named SCtoC Offensive Player of the Year and Defensive Rookie of the Year, respectively. Fresh off his stint as interim head coach of the Colorado Crush during the second half of the 2016 season, Marvin Jones took the helm of the Titans after recently hired head coach Billy Back decided to take a head coaching job with the National Arena League's Carolina Cobras. In spite of their record, the Titans were noticeably more competitive throughout the season versus last season. The highlight might just be the SCtoC 2018 Game of the Year on April 28 in Phoenix against the Arizona Rattlers. The Titans held an 18-point lead early in the fourth quarter, however their defense was not able to hold the lead as they ran into the Darrell Monroe machine. The Rattlers running back scored an IFL record 11 rushing touchdowns off of 140 yards. Monroe scored on a short touchdown run with two seconds left to give the Rattlers the 84-83 win. Those point totals were the top two of any IFL game this season. After winning the United Bowl in their first IFL season, the Rattlers seemed poised for a repeat. They moved on from Cody Sokol at quarterback, but brought in Verlon Reed, Jr., the IFL's Offensive Rookie of the Year in 2016 for the Salt Lake Screaming Eagles. They brought back Monroe and wide receiver Anthony Amos as their base on offense. Arizona opened the season at home against the Storm and saw Reed go down to injury in the first quarter. That brought on Jeff Ziembia, who led the team to a win over the Storm, 39-33. After a 38-28 loss to the Barnstormers in their second game at Des Moines, the Rattlers reeled off eight straight wins. Their next loss would be to the Rattlers in Phoenix; a thrilling 69-68 overtime decision. Two weeks later, the Rattlers fell victim to the Barnstormers, 41-38. The Rattlers made it to the Intense Conference Championship Game where they seemed to be in control in the third quarter. They would only see the Storm tie the game late in the fourth quarter. The Storm claimed their ninth straight United Bowl bid with a 69-68 overtime win. Including the playoff game, the Rattlers' two losses came in overtime by 69-68 scores. For the first time since the 2010 season, the Storm were not the returning champions of the Indoor Football League, as the team was knocked off their IFL pedestal last season with the United Bowl loss to the Rattlers. With a hungry determination to reclaim their lost title, the Storm wanted nothing more to start a new streak of United Bowl trophies. QB Lorenzo Brown, Jr. returned to lead Kurtiss Riggs' offense, along with key receiver Mike Tatum. The Storm lost to the Rattlers in the season opener in a rematch of the 2017 United Bowl, but won their next four games. After a 48-40 home loss to the Rattlers (the teams played just twice), Sioux Falls won three straight before falling to the Barnstormers at home. It was then when the Storm captured five wins in a row to close out the season with a 11-3 record. Due to the Rattlers' sweep of the Storm, and a strength-of-schedule tiebreaker, the Storm entered the playoffs as the third seed with a trip to Phoenix to face the Rattlers in the Intense Conference Championship Game. The Rattlers held the edge, 62-59 with under a minute to go when Miles Bergner hit a 30-yard field goal to send the game into overtime. Ziemba hit Dezmon Epps for a 16-yard touchdown in the first overtime, but Sawyer Petre's extra point attempt was blocked by Dezmin Reed of the Storm. Damien Ford's 20-yard pass from Lorenzo Brown, coupled with Bergner's converted extra point, sent the Storm to the United Bowl for the eighth consecutive season. From the beginning of the season, it appeared that in bringing over quarterback Drew Powell from the Danger over the off season, the Iowa Barnstormers had not skipped a beat from 2017. Powell was named IFL Offensive Player of the Week for Week 1. Behind their enthusiastically enigmatic head coach Dixie Wooten, the Barnstormers were on a mission. Iowa won their opening two games of the season. Behind quarterback Drew Powell, they were nearly unstoppable, despite a Week 4 loss to the Storm. When Powell missed two games due to a CFL tryout, backup QB Grant Rohach filled in nicely for the Barnstormers, going 2-0 in Powell's absence. Upon Powell's return, the Barnstormers continued to fly high for the rest of the season, rattling off seven straight wins before falling to the Storm on a fluke field goal return safety in Week 16. With a pair of receivers in Brady Roland and Ryan Balentine, Powell already had established targets. The Barnstormers blew out the Titans in the regular season finale, 54-21, and earned the first seed in the IFL playoffs. They easily dispensed of the Danger to become the United Conference Champions. Following the season, Powell was named SCtoC Offensive Player of the Year[/u][/a], and Wooten won [/font]Head Coach of the Year honors. The tenth United Bowl was a spectacular game. The Barnstormers and the Storm clashed in the big game and it went right down to the wire. The game was a back-and-forth battle which came down to the final moments of the game. RB Jamal Tyler's eight-yard run accounted the final tally of 42-38. In the spirit of great championship games, the Barnstormers' incredibly stout defense held off the Storm's final rally, which anointed Des Moines as Title Town for the 2018 season. The game was destined to come down to the final moments, which it did. As SCtoC dubbed it, United Bowl X (shouldn't we begin using Roman numerals for these championships?) did not disappoint. What started with the promise of what could be, ended with the most competitive United Bowl in the 10-year history of the IFL. Fans were treated to not only the best level of the IFL, but outstanding in-game promotions. 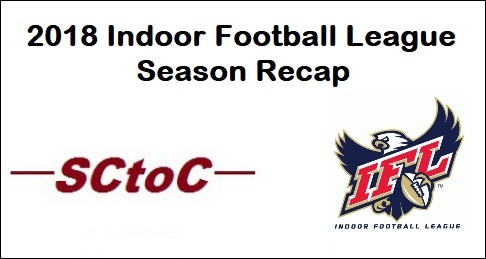 The IFL was posed with the daunting task of promoting an indoor football season, and it delivered. As with any off season, there are anticipated to be new teams, new coaches and new players. SCtoC has learned of one potential team from another league which is seriously making the jump to the IFL. There could, perhaps, be others. The Edge have previously stated they will join the IFL for next season. We have yet to receive confirmation on that, but will report any news which comes in the following weeks and months. The IFL seems destined to grow. While no announcements have been made, we will look for news of any such additions. - All three overtime games in the IFL this season, two during the regular season and one in the playoffs, ended with the winning team scoring 69 points. The first was in Week 13 when the Barnstormers overcame the Arizona Rattlers, 69-68, in Phoenix. The second of the overtime games came in week 17, the final week of the regular season. The Blizzard took the Storm to three overtimes before falling, 69-61, in Sioux Falls. The third came a week later in the Intense Conference Championship Game and also involved the Storm. Sioux Falls was in Phoenix in an attempt to up seat the defending champions. The Rattlers struck first in overtime, but the extra point was blocked. The Storm scored on one play and Miles Bergner's extra point sent the Storm to the United Bowl with a 69-68 win. 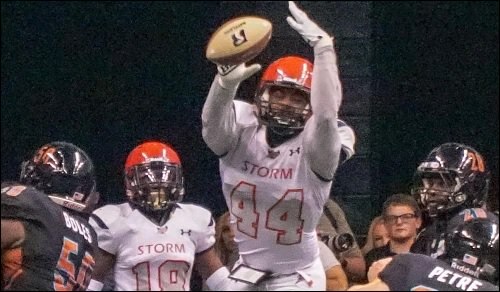 game paved the way for the Storm to reach their ninth straight United Bowl. - Cancellation of the Week 8 game between the Titans and Blizzard in Green Bay actually evened up the overall IFL schedule. Blizzard-like conditions (would you expect anything else to cancel a game scheduled for Title Town?) forced the teams to skip the week. However, while the other four teams were slated for 14 regular season games, but the Titans and Blizzard were slated for 15. While additional football is a treat for any fan, the cancellation of that game brought all six teams down to 14 regular season games, The Titans and Blizzard still played each other twice; once at home and once away. - YouTube. Again, streaming games on YouTube was a tremendous asset to the IFL. While a pay streaming service may bring in more revenue, having free streams increases exposure and fandom. Any money which could be brought in by charging for streams could be offset by a bit higher advertising rates which come from more exposure. Also, Props to MC22 for broadcasting Barnstormers and Titans games, and to Fox Sports Arizona for bringing the Rattlers to Arizona fans. - After three seasons away from IFL action, defensive back and kick returner B.J. Hill proved he is still one of the best in the IFL business. During the last half of the season, Roberson even gave Hill a new position, that of running back. He ended the regular season as the Blizzard's leading rushing with 71 carries for 315 yards and 4 touchdowns. He caught 18 passes for 206 yards and two scores. Hill, already an IFL Hall of Famer also continued his dominance as the return game and in the defensive backfield. The Blizzard would be dutiful to bring Hill back in 2019. Roy Choi will lead the new ownership group bringing the Titans back to the IFL in 2019. - To Roy Choi: Best yet. Hiring Ryan Eucker as general manager is the best first move you could have made. No better move you could have made. You have a proven community related, fan re-lated and successful leader of a franchise. You could have not made a better choice. Ryan Eucker, "Ike," welcome back to the IFL. - To the IFL and its teams: This will call into play arena scheduling and arena availability. Stagger your game times. If you have a triple header on a Saturday, start your games at 1, 4, and 7 central. Having a single game on at once with no conflicting time will only lead to more exposure. Instead of showing a game at a time, show all three on a triple header. Scheduling two, or even three, games on at the same time makes it more difficult for fans to follow live. Yes, with the YouTube streaming repeats are readily available, but that said, I would suppose that enabling fans to watch more games live will increase both viewership and fandom. Depending on the number of games, you may also want to schedule Friday evening games, as well as more matinée Sunday games. The more chances you get to show live games, the more exposure you will get. Of this, I am personally confident. - To the IFL: While having one overall division with six teams, if the league adds two teams, then return to the two-division league. With more teams, there's even more reason to do so. The IFL kept the United and Intense Divisions alive by assigning the current standing conference trophies for the semi-final games. This was an excellent move. Ideally, there would be enough teams to solidify the establishment of divisions going forward. A minimum of eight teams would ensure multiple divisions. - To owners of the Cedar Rapids Titans or any franchise in need of a head coach: Hire Marvin Jones. 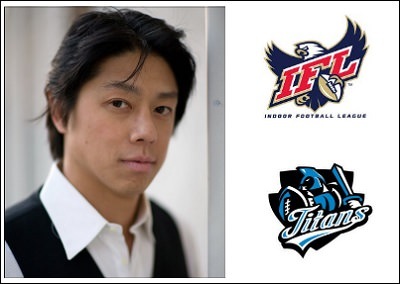 Whether Choi's group brings him back, or even another teams picks him up, Marvin Jones is an IFL head coach. The earlier the better. As interim head coach of the Crush in 2017, his team effectively knocked the Wichita Falls Nighthawks, a 12-4 team, out of the playoffs with a 77-73 win late in the season. He got a late start with the Titans in the 2018 season and was still able to build a competitive team. Had the Titans won a single game over the Danger, they would have entered the playoffs in place of Nebraska. - To the Blizzard and Titans (and potential new teams): Get started on your off-season plans early as possible. There are three teams who are solidified in the IFL. A fourth has already hired its coach. Hiring a head coach (such as Jones) earlier rather than later will give them more time and allow them to build a scouting team and go out and get great talent. That's how your teams are going to bring in talent and bring in players which can challenge the likes of the Barnstormers, Storm and Rattlers. - To the IFL: Update game stats during the playoff games. It's done for every game of the regular season, but with nothing during the conference finals and even the United Bowl. It's just three more games (perhaps more if more teams are added). While it aids the internet media, it also helps paint a picture for the fan while watching the games. Personally, it would be very appreciated. - To all Teams' in-game promotional teams: Keep doing what you're doing. From junior cheerleading exhibitions to the in-game contests, you continue to make the IFL the predominant indoor football league as far as fan experience is concerned. Many teams in many leagues do this, but the IFL does it best as a whole. The promotional teams are the best in the business. Absolutely keep it up. - To current and potential IFL players: The IFL is a tremendous league and is the most progressive of any indoor/arena league out there. The Arena Football League started this sport over 30 years ago. However, the AFL is now a shell of itself. No one knows what may happen in either league, the IFL has the opportunity to elevate itself to the pinnacle of this sport. This is certainly a league where players are welcome and have a chance at getting noticed at the next level. 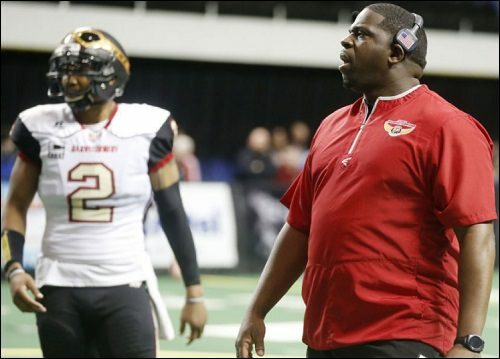 - To Barnstormers head coach Dixie Wooten: You are now the coaching face of the IFL. Active on social media, steady yet animated on the field and you cook for your players. There is steady leadership with Kurtiss Riggs of the Storm and Kevin Guy of the Rattlers, but fans enjoy your enigmatic style. Not that I have to mention it, but keep being the players' coach and bringing an exciting element to the league, its fans, and even to the media which covers this league. I believe I speak for all of us at SCtoC when I say it has been a terrific season for us to follow. We have provided detailed previews of each of the 45 IFL games over the course of the season and the playoffs (actually, Nevadanut prepared a preview for a 46th for the canceled Titans-Blizzard game, which has gone unpublished). We looked forward to bringing the IFL to our readers, fans of the league and other sports fans who come to our site. Personally, I enjoyed bringing the first recaps of each game to those readers. At least, in most cases. So now we close the case on 2018 and look to what hopes to be a promising 2019. SCtoC will be there, and we anticipate another exceptional season. Incredible recap! This was a fun season to follow. There may have been fewer teams, but we all got to know them better. It was so great to see a new champion. The Barnstormers earned this all season long and they deserve to be considered the best in the IFL. Dixie Wooten rocks and Drew Powell was amazing all season long. I agree about the Titans hiring Ryan Eucker. I know what he has meant to this site from when he was with the Empire. I really see Cedar Rapids building something special next season. If they can bring Jake Medlock and Ricarlo Bell back, next year, they really have a chance to compete. Ryan will build an awesome organization. I also like what you said about staggering the games. We did a great job (I think) about covering all three games at once, but avoiding conflicting games would be great for the league. Great piece Angi. Here's hoping the IFL is bigger and better next year! It turned out to be a pretty entertaining season. The Barnstormers winning the United Bowl was huge, but there were several other stories which made the season extra special. I really like how you encapsulated everything here. I agree that I would like to see the league schedule more games at different times. There is nothing like watching live.